Correction (10/10/11): Venga! is now closed and will re-open at a future date as a Mediterranean Restaurant with an Israeli focus. There is a new cafe, patisserie and gelateria all rolled up into one on Canon Drive in Beverly Hills. No, it’s notÂ Bouchon, but from one lunch experience, I ended up very surprisingly pleased with the results. You will appreciate the small, concentratedÂ menuÂ once you step inside the nondescript shop. 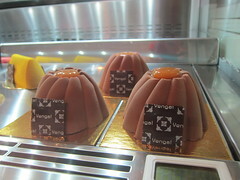 Although it’s hard to tell exactly what they do since the dessert cases face sideways, it seemed like the neighborhood had at least mildly become acquainted withÂ Venga! just two weeks into their opening on a sunny Saturday afternoon. Owner Shahriar Besharat and Pastry Chef Kriss Harvey (who has studied under the tutelage of Pastry Chefs all over the world as well as with Master in Gelato Giuseppe Scaringnella and in the Carpigiani Gelato University in Bologna; Joel Robuchon Las Vegas is on his resume) have cultivated a brightly-lit cafe with a minimalist look and menu – but the strength rests in these few items. For instance, theÂ slow cookedÂ chicken sandwich is prepared in a vacuum and packs punch with slices of jalapeno and carrot. It’s tender thanks to its preparation, but it’s also got great flavor.Â The Croque Monsieur (or Madame, should you choose to add a sunny-side up egg for $1, as we did) is delicious. Too often have I had a Madame with bread that was too thick and overwhelming. At Venga! the layers were harmonious in thickness as well as taste – not too rich, and just enough. 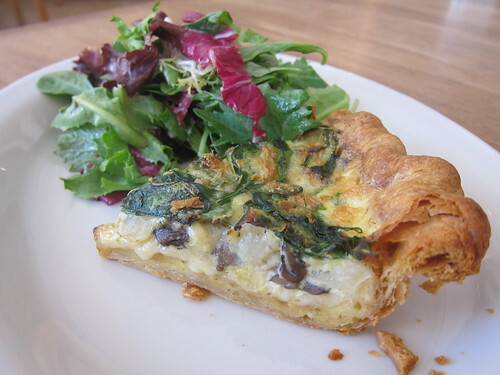 The quiche with spinach, shiitake mushrooms was also tasty. The crust was golden and delicious. I almost wanted another slice. The tomato salad with whipped cheese and basil is also a beautiful rendition (perfect for before the end of summer) – especially with the heirloom varieties that are used. But you mustn’t leave before you have dessert. This would be a grave omission. There are plenty of gelato varieties to choose from, but my favorite was the Almond with Caramelized Almond flavor. The Passion Fruit Sorbet was also super potent and a perfect flavor for a hot day. The macarons are also delicious, and a tad denser than others that I’ve had. 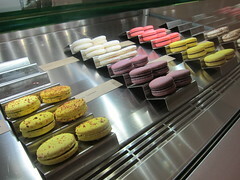 I can’t argue with more flavor in my macarons, however, and there are plenty of flavors to go around. I love the dustings on the outside of some of them, which add quite delicious details. Salted Caramel and Coconut are now my go-to. 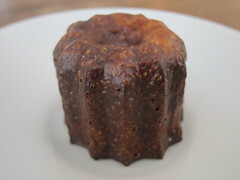 A must-try is the CanelÃ©, which is done quite expertly with the outside coated with a crispy beeswax. The inside was a soft, tender, almost-custard texture – just how a perfect CanelÃ© should be. As you peruse the brightly-lit pastry cases, you’ll definitely have a hard time resisting all of the beautifully presented pastries in all their colorful glory. I’m due for a return visit to try some more. Alas, I’ve learned that they have free wifi! This could be a dangerouslyÂ indulgent destination (yet productive?) for me in the near future. Blog or eat? Lunch, dinner or dessert? Now, I won’t have to choose. This entry was posted in Beverly Hills, Dessert, Food, lunch and tagged Beverly Hills, cafe, Canon, coffee, croque madame, croque monsieur, dessert, Dinner, espresso, Kriss Harvey, lunch, macarons, pastries, pastry chef, quiche, salad, Shahriar Besharat, Venga!, wifi. Bookmark the permalink.